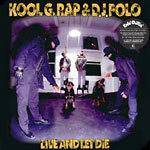 Before a time when future superstars like Jay-Z idolized Hollywood crime sagas like the Godfather, Scarface and Goodfellas through their music, Kool G Rap and DJ Polo set out to explore a new style in hip hop that came off sorely misunderstood, and poorly misconceived by the mainstream media as ''too violent'' or over-glorifying ''gangsta rap.'' Storytelling and concept albums can always be a tough approach in hip hop, as most of the narrative is delivered in the first person, thereby confusing casual listeners or those not fully aware of the disclaimer and underlying themes about the consequences of the underworld criminal lifestyle. It's always made great TV and a movies, and arguably hip hop is one of the only genres that also makes this work in music and turned the Crime Drama genre into such a huge hit in the 90's no matter how many awards a film garnered at the time. I'll admit it wasn't until Wu-Tang or Nas that I discovered and began to pick up on quotes and lines from movies like Scarface, that made me want to go watch the film itself. Live and Let Die is one of the first of its kind and an all around hip hop opera. Often replacing the stereotypical mafioso characters and story lines with the real life dangers and equivalence of the inner city streets, keeping this album relevant and revolutionary for its time in regards to hip hop and creativity in the then shunned genre in its infancy. Classic! Deluxe double LP reissue -- back on vinyl for the first time since the 90s!